Far Above Rubies: Mikasa "Italian Countryside" flatware giveaway! One lucky person will get a 42-piece set of "Italian Countryside" flatware which includes eight five-piece place settings, a serving spoon and meat fork all in a beautiful wood caddy! 1. Leave a comment here to let me know you are a "follower" for one entry. 2. "Like" the MikasaDining Facebook page: www.facebook.com/mikasadining for another entry. 3. Post the name of your favorite Mikasa pattern on the Mikasa Facebook wall for another entry. 4. Visit www.mikasa.com and sign up to receive special offers and promotions from Mikasa for another entry. 5. Post it on your sidebar for another entry. Make sure you come back here and leave a comment letting me know which of the above you do so I can add to your entries! Deadline for entries is midnight EST October 29. So tell your friends, get over to Facebook, and let's get started! I am really excited to be part of this giveaway because I really do love the quality of this beautiful flatware! FYI...I am not an employee or affiliate of Lifetime Brands, and I received the Mikasa items at no cost to review. The opinions here are mine and do not necessarily reflect the opinions of Lifetime. Hi Anita! I'm a follower-thanks for the chance! I've added your fun give away to my side bar! Please enter me for this beautiful set!! I am a follower!! Thanks for this opportunity. I am your first follower I believe. Left a comment on Mikasa about my favorite pattern. I am a follower!...I need to win so I too can do elegant tablescapes,mine are always casual. i am a follower and ty for a chance!! Hey again! I am one of your biggest fans and a follower! I am already a facebook follower of Mikasa too! I already "liked" them! I love the French Countryside pattern, but I have to say I am leaning more now towards the Italian Countryside after seeing all of your beautiful settings and it would look great with my new "other" brand of china. LOL! Adding your fabulous giveaway to my sidebar! I am a new follower and having trouble posting a comment. I thought the first comment went through, but it apparently did not. Thanks for the opportunity! Thank you for the chance at this give away--I am a follower who needs new flatware! What a wonderful giveaway. I am a follower! I am a follower and enjoy your tablescapes. Your current one is just fabulous...I love the outdoor setting and the natural elements you incorporate on the table -- leaves, acorns, ferns and driftwood, etc. You know I'm a follower, I also "Like" Mikasa and posted on their FB page that Italian Countryside is my favorite pattern. I would love to win this giveaway...trust me...it would most definitely be used with loving care! This is such a gracious giveaway! I like Mikasa on their FB page!! Great giveaway...count me in! I'm already a follower and "like" Mikasa on facebook. I have posted my favorite pattern as well. Thanks for having this for us. (Don't have a blog). I left a FB comment that Italian Countryside is my favorite pattern. I love it! I signed up for Mikasa promotions! Anita...another wonderful giveaway!! Gotta love those gals from Mikasa! I get 4 out of 5 entries. In an oddball effort to space my chances down the comment roll, I'm commenting again to tell you that I gave the shout out on my side bar. Love, love, love the flatware, thanks for such a fabulous giveaway! Hi Anita, Love the flatware and I am a follower. I left a message at Mikasa FB wall that I like the French Country pattern. Hi Anita. What a lovely gift. The flatware is charming. I am a follower, thanks for the chance to win! Hi, Anita! Thanks for stopping by tonight! So glad you did!!! Wow...I just looked at your entry for this week and it is a doozy!!! Looking at the wooded backdrop, I see where you got all those fabulous branches for your great centerpiece last week! You live in a total oasis!!! This week's centerpiece is a stroke of genius with the driftwood!!! Everything is so pretty! I hope you have a really relaxing week out there in "heaven"!!! See you soon!!! Anita, I'm so glad I found your blog. I linked you from Debby's blog, My Country Oven. She posted that you make all your own linens and all I can say is WOW! They are beautiful. I can't wait to check your blog for more beautiful inspiration. wouldn't dare miss your postings... of course I follow.. whether you are hosting a give-a-way or not!!!! Oh my goodness! What an incrediable GiveAway!! I get 5 out of 5 entries. Thanks for hosting such a wonderful giveaway! pick me....I am a new follower Liked on FB,Favorite pattern posted, Signed up for promotions, and Added to my sidebar. Whew! I figured it all out.....Thank you for an awesome giveway! 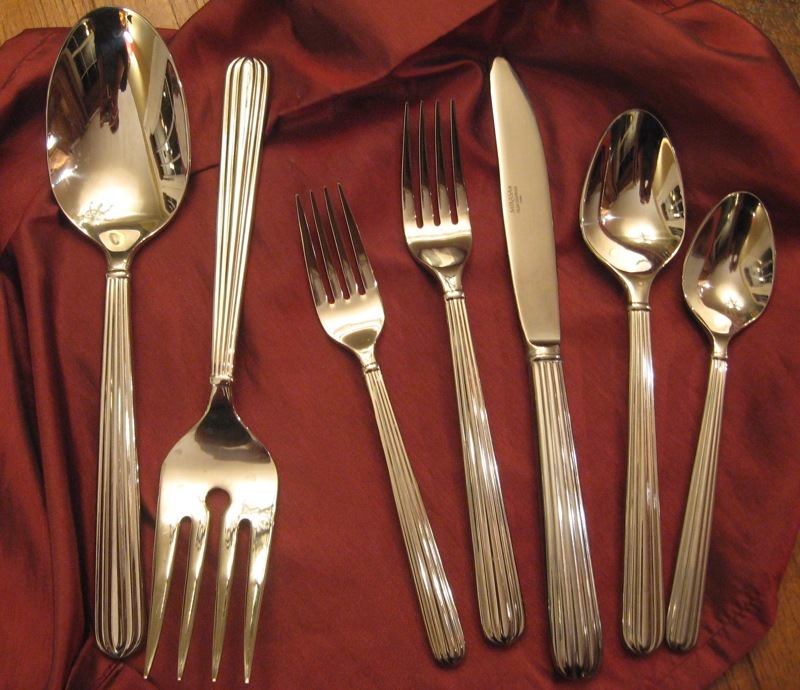 Such a beautiful flatware set, the design looks very classic. Please enter me in the giveaway, I'm a follower of yours. I am a new follower. Beautiful flatware. beautiful silverware be nice at the t-giving table!! I'm a new follower via GFC -what a great site! I am a follower - great giveaway! Love Mikasa! OH I so want this Give away! I have never won anything before, but this one has just got to come to my home to live with me! OK so I have done all five entries to try and win this one this time! I just signed up to LIKE on Facebook! I am a new blogger and a new follower. TY for the chance. I am a new follower. Would love to win the flatwear. I would love to win. I am a follower. I posted my favorite pattern on FB. It is called Stephanie. Oh yea, I also signed up for special offers and promotions, and I wrote on Mikasa's wall as far as what pattern I like best! Have a great day! I'm posting this on my side bar right now, Anita :D Thanks Heaps for co-hosting another great event! Thanks for the chance to win flatware to match my Italian Countryside dishes! I love this Mikasa pattern, and I could sure use a new set of flatware as our everyday is looking a little worse for the wear. And you know I'm a happy follower of your blog, Anita! Thanks for the chance to throw my name in the hat. I don't do facebook, but if I did, I would "friend" them. I think that's what I've heard people say who do! LOL! Hi, I am a follower. Love your blog!! 5.. am posting on my blog now! please enter me in this giveaway..
and make me a winner!! i really want that beautiful flatware!! Love your blog and thank you for sharing....I am a follower and signed up on Mikasa for email on last giveaway.Thank you. I have "Liked" Mikasa on Facebook for some time now! I recieve special offers from Mikasa! do i leave a comment for all? I've done it all.. I follow and I would love this set, it would match everything I have!!! thanks for the chance. Thanks for the chance to receive this great set of flatware. I am leaving a comment here though I am not an official follower, I love seeing your tables on the BNOP. The Far Above Rubies is a wonderful blog name. I have also "like"d Mikasa dining on Facebook!